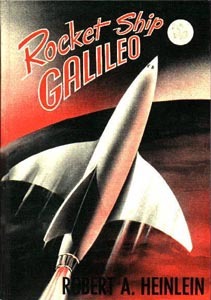 This story of three boys who build a rocket ship to the moon is Robert Heinlein’s first published novel, one of a series of juvenile fiction books he wrote early in his career. What is juvenile fiction, you ask? After reading this book, I gather that it is a book targeted at grade school boys, as opposed to adolescent boys for whom most Heinlein books are written. Instead of unrealistically accommodating women, this book has cloying science lessons and life advice. The story itself is pretty good, but weird considering the timing. It takes place in the future … of 1947, when the book was written. It was also really, really slow. I almost was unable to finish it, and fairly loathed reading it, until the very end. At the end the book gets super exciting, and I might just go ahead and read the follow up books, at some point. I spent the weekend in St. Michael’s, Maryland in a beautiful house overlooking the bay. Yay family! My aunt, the owner of the house, handed me a book as soon as I got there and said she read it in one sitting–she just couldn’t put it down. Now, this is a work-a-holic woman who spends most of her time in her office and on the phone during the week, and the rest of the time doing chores around her house, so when she recommended a book that she “couldn’t put down” I thought it would be a grand adventure. The Road is an interesting bit of literature. It is the story of the end of the world as we know it, but it is told in a unique manner. The story revolves around a man (only known as “the man” or “Papa”) and his boy (only known as “the boy) who are traveling south in some unknown country after some unknown tragedy that ended civilization. The author does not go into detail about what caused the situation, nor does he expound upon the plight of the characters. It is a rather simple story of a hard journey to outrun the winter and find enough food to make it through the next day. The man and his son scavenge a desolate land where nothing is alive…no animals, no plants, just displaced people. As the story progresses, the reader gets a sense that the pivotal event took place several years before–just a few days before the boy was born, and death and destruction have continued since. The boy’s mother kills herself and the father goes on the run to avoid a little-known threat that is not explained and only seen twice throughout the story; both encounters end horrifically and violently. I liked this story and I liked the author’s style. This really was a typical end-of-the-world, if-we-don’t-stop-we’ll-all-die type of warning book that has been popular for decades, but the author approached it in such a way as to make it much more terrifying and unsettling than any other I’ve read. He didn’t give detailed scenes; he didn’t explain the political or social causes of the horror; he didn’t even describe what was living and what wasn’t. Everything was just there, revealed to the reader as the two main characters experienced it, underscored with a definite message about the nature of living and what humans are capable of. The author used no quotation marks, which left the reader uncertain as to who was speaking or if it was a thought. This uncertainty put the reader on edge, and heightened the general horror of the story. The lack of detail allowed for the imagination to run wild, and the few detailed glimpses of actual horror just bolstered the imagination instead of dampening it. I recommend this book as an emotionally moving piece. It sticks with you during the read and well after. I read it in one sitting, not only because it was good, but because I knew that I couldn’t put it down without knowing how the horror resolved itself. ANOTHER Redwall book! Where have I been? This one tells the life of a heroic otter who is slave to imbicillic squirrels. It’s the first time that the villain in the story isn’t a rat, weasel, cat or snake, but a normally “nice” creature. Interesting. Rakkety Tam leads a slave rebellion and frees Redwall from some drama or other. Pretty good. This is the Japanese book the blockbuster movie was based upon. I saw the movie first, which, in my opinion, is the best way to see movie/book combinations, and I was right in this case. The movie is only based on the book, and leaves out the strange explanations for the supernatural phenomenon chronicled in the story. The book makes more sense, however, since it wasn’t being written for a sequel, and left me feeling satisfied at the end. The author did a great job creating tension throughout, and I found myself rooting for the lead to alternately die and live. An interesting dichotomy. If you liked the movie you’ll love the book. A nicely written children’s story about a group of ferrets who have the job of rescue workers on the high seas. It’s part of a series of books that chronicle a variety of everyday exciting jobs by replacing real world scenarios with animal cast members. I guess the author is trying to expose children to a variety of adventurous and possibly heroic jobs without boring them with humans. I must admit, I wouldn’t have picked the book up if it was about people doing the same thing–it would seem too much like studying. It was enjoyable, but not all that memorable. I haven’t yet bothered to find the next book in the series. I wonder if I ever will? Oh, this book was ok. It was a silly little mystery, except that the main character was a man. Of course, I didn’t quite realize the main character was a man for 50 pages or so…I was really very confused why everyone was calling her “Harrison.” Does this problem speak to my abilities as a reader, or the author’s abilities as a writer? That’s a thought for another time. Anyhow—it was a very basic mystery. In fact, the mystery was almost secondary to the day-to-day life of the main character. The story is about a guy, Harrison, who inherited his late aunt’s candle shop as well as the storefronts and apartment that house it. One of his store owners gets murdered, and he has to figure out who did it in his spare time (I wasn’t exactly clear as to WHY he had to figure out the murder and just couldn’t leave it to the police, but I digress). The book followed him as he learned about candle making (lots and lots about candle making. It actually got rather tedious) and decided to date again. Meh. It was a quick read that killed some time. I’m not looking forward to the next book in the series, though.